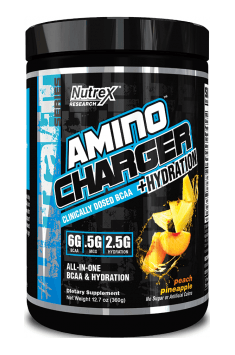 NUTREX Amino Charger + Hydratation is the best choice in the category of amino acid products containing BCAA. The supplement not only provides the effective and clinically tested dose of branched-chain amino acids but also supplies the body system with the necessary electrolytes. In order to support the development of muscle strength and mass and enhance regeneration, each serving provides 6 g of BCAA, taurine and strongly anticatabolic MGG. A specially designed complex of hydrative components which include chelated minerals Albion® is highly absorbable and bioavailable as well as enables you to train intensively even in the most difficult conditions. The human body system is unable to absorb inorganic minerals in their original form and use them properly. The organism has to transform them first into an organic form, which can be then easily absorbed and used. This phenomenon is called chelatation, and its result – a chelate. Bioavailability of chelated elements is much higher than in case of traditional preparations. The environment of the digestive system is not a perfect place for the smooth natural chelatation, because there are many disturbing factors, i.a. preservatives, dyes and ions. The ALBION® chelates contained in Nutrex Amino Charger + Hydratation are characterised by the highest absorption and bioavailability of minerals. The electrolytes contained in the product (calcium, phosphorous, magnesium, sodium and potassium) are chelated ALBION® minerals which are perfectly bioavailable and absorbable without causing any gastric ailments, which fastly complement the electrolytes lost during effort. The mineral is released from the chelate only when there is need for that. Otherwise, it is excreted in the original form, so there is no risk of overdosing. BCAA (branched-chain amino acids) are involved in energy metabolism during physical effort, as a substrate for gluconeogenesis. It has been proven that BCAA applied before and after workout brings many benefits – it reduces muscle damage caused by exercises and promotes muscle protein synthesis. The product provides highly effective dose of L-leucine, L-isoleucine and L-valine in the proportion 2:1:1, which supports the optimal growth of muscle tissue and its regeneration. Taurine is involved in many physiological processes, i.a. regulation of osmotic pressure and protection against oxidative stress. It plays a role of a neurotransmitter, shows immunomodulating properties as well as participates in the proper functioning of the cardiac muscle. It is believed that taurine supplementation supports organism anabolism, increase in muscle strength. It reduces muscle pain after training, promotes durability and regeneration as well as improves concentration during training. In the preparation, taurine plays an important role in the regulation of water and electrolyte balance of the body system. The available clinical data demonstrated that this advanced form of glutamine, complemented with magnesium and glycine (MGG), is characterised by higher stability and more effective raising glutamine level in plasma. This leads to enhanced anticatabolic prevention and promotes increase in muscle mass and regeneration in stressful environment, such as trainings. Coconut water powder is one of the richest natural sources of electrolytes, vitamins, minerals, trace elements, enzymes and antioxidants. Together with other supplement components, it supports body system in the proper regeneration and provides elements necessary for the proper functioning. To sum it all up, Nutrex Amino Charger + Hydratation is a dietary supplement which can be applied both during training and after it as well as at any time during the day when you need to complement the levels of the most important amino acids and electrolytes. As it complements electrolytes loss, the product optimally hydrates the body system, due to the content of BCAA, glutamine and taurine. It also counteracts catabolism and provides better regeneration. All ingredients and their doses are overt. On training days drink 1 serving during or immediately after exercise. Shake container before each use. Mix 1 scoop in 8-10 oz of cold water and drink between meals. The product is designed to hydrate the body system both during and after training. It protects from catabolism of the muscle tissue and optimises post-workout regeneration. The supplement should be used during or after training. It can be also applied at non-workout days, in case of unplanned and long breaks between meals and to balance electrolyte losses during hot weather or intensive sweating periods. Cosmic Burst: Malic Acid, Citric Acid, Natural and Artificial Flavor, Trisodium Citrate, Silica, Potassium Chloride, Sucralose, Acesulfame Potassium. Contains coconut. / Grape Apple: Malic Acid, Citric Acid, Natural and Artificial Flavor, Trisodium Citrate, Silica, Potassium Chloride, Sucralose, Acesulfame Potassium. Contains coconut. / Mangoberry Lemonade: Natural and Artificial Flavor, Malic Acid, Citric Acid, Trisodium Citrate, Silica, Sucralose, Acesulfame Potassium. Contains coconut. / Peach Pineapple: Malic Acid, Citric Acid, Natural and Artificial Flavor, Trisodium Citrate, Silica, Sucralose, Acesulfam Potassium.